BRACE yourself, Rudolph Ingram is coming. The seven-year-old kid known as "Blaze" from Tampa Bay in Florida is the scariest thing on the internet right now - no joke. It's been six months since Blaze first went viral when NBA superstar LeBron James posted a video of Ingram exploding through defenders in a local little league game of American football. The scary thing is that in the last six months, Ingram has actually got more freakish. The sprinting sensation over the weekend returned to the track for his first athletics meeting of 2019 - and it's an actual joke. The video of Rudolph competing in the first 60m and 100m sprints of the American Athletic Union season in Florida has him going viral all over again. He is in a league of his own in the videos, exploding out of the blocks in the 60m dash and embarrassing the field of older competitors in the 100m. The newest sprinting clip has seen his number of Instagram followers climb above 260,000. 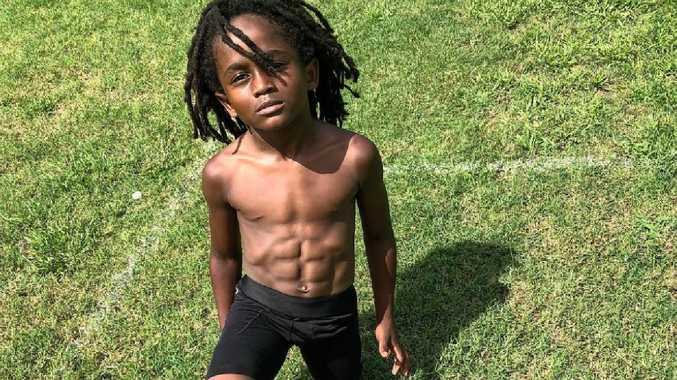 Under an Instagram account operated by his father Rudolph Ingram Sr, it is claimed that the pint-sized freak completed his 100m dash in just 13.48 seconds. That time is an astonishing 1.5 seconds faster than his reported personal best in August last year. It's also a new world record if accurate, smashing USA Track and Field's official record of 13.67 seconds for seven year olds. The kid is going to be unstoppable, unbeatable, if his development continues on its upwards trajectory. More importantly in the past two AAU athletics national championship meetings he has won a combined 36 medals (including 20 golds). At the AAU 2018 championships in Orlando in July he finished first in the 100m sprint and second in the 200m dash for seven-year-old boys. Oh, he's also had a six-pack since he was five years old. His only problem is that he is just as freakish on the football field as he is on the track. Six months ago it was Ingram's football videos that had the internet losing its mind. At the age of six, Ingram was last year playing running back and safety for the Tampa Ravens in a league for older boys. As you would expect by now the videos are spellbinding. Even against the taller, older opponents Ingram is dazzling, freakish. Heading into the 2018 football season, Ingram was reportedly measured at less than four-feet tall and less than 50-pounds (23kg). He is pure, concentrated, explosive power. He scored 10 touchdowns last season for the Ravens and was named the team's MVP for the season. It's no wonder his Ravens coach Jimmy Watson was left blown away last year. "At running back you can count on him to put the team on his small back and carry us to the promise land." he said, according to youth1.com. "At Safety it's unbelievable how he can make plays in the backfield. At running back he's very fast but even more elusive. The kid has vision like I've never seen in a 6-year-old before. "One second he's going one way and then you blink and he's going another way. He stops on the drop of a dime And runs so aggressive. The kid is one in a million at safety. "He's so fast. He gets to the ball in the backfield and has great hips. I've yet to see someone put a move on him. The kids is an all-around great player." While his track career is also blowing up, Rudolph Sr has previously admitted he wants his son to play in the NFL - if that's his son's true desire. "I realised Blaze had a gift... three years ago," Ingram Sr said last year after LeBron's social media account saw his Instagram page attract 1000,000 followers almost overnight. "When I see LeBron James comment on it, it was like a stamp,"
"Once LeBron likes it, everyone likes it. For me to see him go viral, I love it. I feel like with that viral platform you can do so much with it, from positive notes, inspirational notes."